This web2.0 tool allows students to upload photos and record information. They can record by voice, webcam, drawing or typing. Once it it published, others can comment on their work. The students would love for you to leave comments on their VoiceThreads! You simply sign in on the VoiceThread website with an email address (and create a password) to respond to their work. You can type, record your voice, or use your computer's camera to leave a video comment. You can search VoiceThread by the title of the project if you know it. Some VoiceThreads are also embedded on student web pages. Mrs. Dietsch's and Ms. Hoppe's third block reading class is split into several groups, each reading their own novel. In class they have been studying the structure of how a story is written. They are finding graphics for each part of the story and then recording their voices to tell what is happening while that graphic shows on the screen. They are using a Web2.0 tool called VoiceThread. 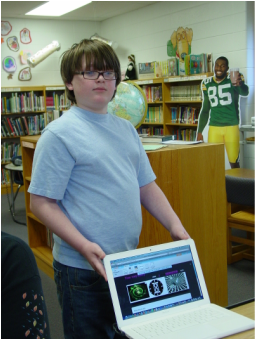 Nate proudly displays the web page he created.